I say all of this not with the intention of eliciting sympathy, no, we choose this life, and although at times we question whether or not we should pursue a move to one particular hub or another, we have decided for the time being that we are in the right place for raising our family. This may change as kids grow and age and fly the coop, and then we could realistically look at 3 or 4 bedroom homes; however, that’s not our current reality, and we firmly believe God has us here for a reason (if not two or three reasons). Although busyness and life often keep us from being involved in many areas, we have found that prayer is a way to stay connected to our community and also feel like we are engaging spiritually to the well being of friends and family. Prayer is an important part of our family life. Ryan and I come together every morning to pray. We pray for our marriage, for our family, and for our community. As a family we also pray before the evening meal, and we collectively pray before the day comes to an end. This tends to look a little different (obviously with 8 children) than our morning sessions but it’s the lessons we’re instilling in our children that I believe make the difference – the concept including that the people we are blessed to have in our lives matter, and we lay their needs (and our own) before our Heavenly Father. Occasionally we seek out prayer books to help us when we struggle to find the correct words or any words at all to say. 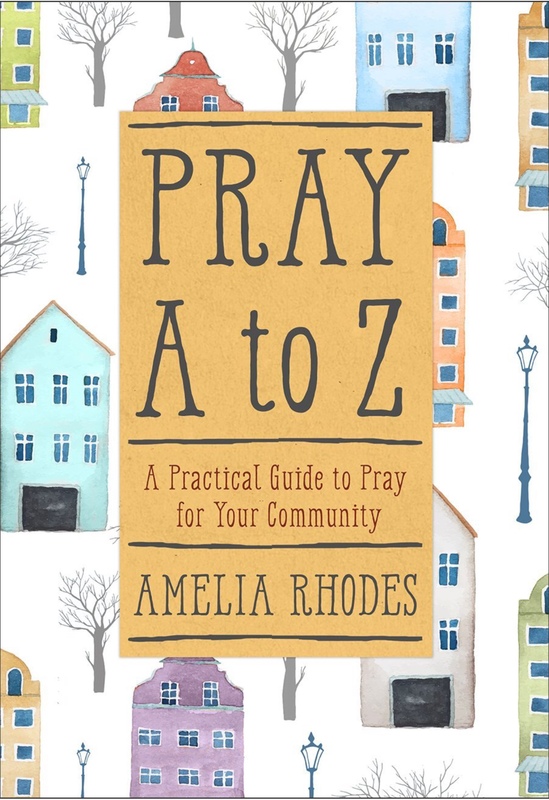 My friend Amelia Rhodes wrote a book that I’ve been using often in my personal prayer life called Pray A to Z and this has been an incredible resource personally as a busy mom who is deeply invested in community but who also doesn’t have a lot of spare time to be literally hands and feet in my current circumstances. This book offers one page prayers, on the A to Z spectrum, ranging from how to pray for someone going through adoption, to hunger, to pain, or ugly thoughts. This resource isn’t meant to be read cover to cover and instead is meant to be used as you notice a need and then desire a way to vocalize a prayer on the behalf of the need. I’ve really enjoyed using this book for a number of needs I’ve witnessed in the lives of many individuals I know and love/ I know many people would benefit from this easy to read resource, and I have a copy to give away to one lucky winner! So, go ahead and comment below or on a social media post about how you would use this book to pray for your community. I’ll pick a winner on Sunday evening.